A board game that'll suit if you're enjoying the sci-fi city builder. Each week, Jonathan Bolding picks a great PC game then selects a matching board game that fans of that title will enjoy. This week, players who enjoy colonising the Red Planet in Paradox's recent Surviving Mars might enjoy FryxGames' Terraforming Mars, which has a PC edition on the way too. Perhaps in the past few weeks you have enjoyed building domes, delving mines, and pumping water in survival city-builder Surviving Mars. It’s a game that serves a very specific kind of player, one who thrives under pressure and loves to see their planning come to fruition. It rewards a kind of long-term strategic thinking that relies on consistency in moment-to-moment choices. It’s about knowing what your plans are, but also knowing when to spend those carefully-hoarded resources on a power station right now rather than saving them for that new factory. But, given its relative success, it must also appeal to some other kind of player. The dreamers among us. The people who love the basic idea, the fantasy, of humanity reaching for the stars and colonizing another planet. It is, given the rapt attention that seemingly every nerd I know pays to SpaceX’s every maneuver, not a stretch to say that lots of people interested in strategy games want to go to Mars. Living on the red planet is a fantasy that lots of us seem to enjoy. So if you're interested in Surviving Mars, how about not just surviving, but thriving? 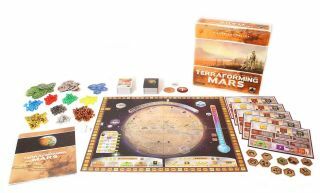 Delicious board game Terraforming Mars imagines just that, outlining a reality where the red planet is set to be turned into a new Earth—given atmosphere, liquid water, and a liveable temperature. Of course, all of that is expensive, so the covert capitalism of Surviving Mars is thrown out the window in favor of some overt capitalism a la Offworld Trading Company: congratulations, you're now a megacorporation. In each round of Terraforming Mars—called a generation, given the huge time scale of a terraforming operation—players choose corporate objectives, lining up new jobs, then executing projects and constructions on Mars and in surrounding space. At its heart, it’s an engine-building game. You spend resources to get cards that let you get resources more efficiently, gathering them up and assembling them like parts of an engine. You might specialize your company into constructing rovers and producing steel, for example, ensuring that as you use that steel to construct new cities you make a portion of your investment back. After all, those people in the dome cities need your rovers to get around. The trick is to do that better, and sooner, than any of the other players at the table. You compete with other players over real estate on the planet, but more than that you compete for milestones: who can found more cities, who can fill more oceans, and who can raise the planetary temperature (I recommend crashing down a few dozen asteroids for that last one. Knocks the ol' thermometer right up). Terraforming Mars is good because, like Surviving Mars, it's a game about balancing moment-to-moment choices with a long term strategy. You don't know what random opportunities are going to come into your hand each round—your pool of projects come from a random draw—but you do know your overall strategy. Whereas in many other games you can simply choose a strategy, then execute it, Terraforming Mars forces you to adapt that strategy on the fly.